The use and misuse of opioids has steadily increased since the late 1990’s. When used as prescribed, patients feel pain relief. 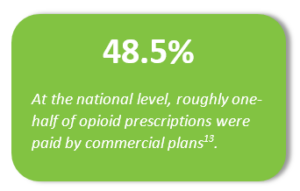 However, the opioid epidemic began largely with individuals using opioids for medical reasons (80% of users)1; secondarily those misusing the drug have led to increasing concerns. 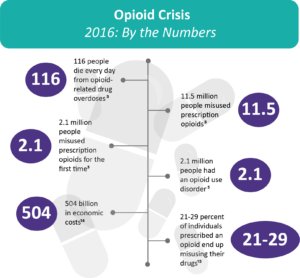 This article will examine what opioids are, the rise of the opioid epidemic, a look into integrative and complementary care and workforce impact. For anyone that has suffered a severe injury or has h ad surgery, they most likely were prescribed opioids from their physician to manage the pain. Opioids are narcotics; they attach to receptors (a part of cells) in the brain, spinal cord, etc. and send messages to the brain to block and reduce feelings of pain. Opioid pain relievers are generally safe when taken for a short time and as prescribed by a doctor. However, since they produce euphoria in addition to pain relief, they can be addictive and misused such as taken in a different way, in a larger quantity than prescribed, or taken without a doctor’s prescription. Patients can build a tolerance leading to dose escalation, physical dependency and an increased craving for the drug leading to what is known as opioid use disorder (OUD). 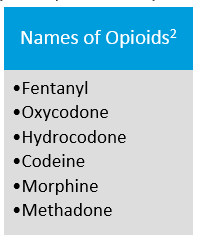 This increased use or misuse of opioid pain relievers can lead to addiction, overdose incidents and deaths3. Opioid Crisis – How Did We Get Here? In the late 1990s and early 2000’s, the medical community began to prescribe prescription opioid pain relievers on a more frequent basis. Why? First, pharmaceutical companies provided reassurance to prescribers that patients would not become addicted. Unfortunately, this was not the case and led to widespread prescribing of these highly addictive drugs, a sharp rise in misuse, overdose and deaths rates were realized4,5. In addition, the Joint Commission introduced the idea of pain as a fifth vital sign in 2001 which required providers to ask all patients about their pain also leading to overtreatment and overuse of opioids6. With more than three out of five overdose deaths involving an opioid7, it is time to buck the trend. The CDC has developed a series of campaigns aimed to educate both providers and patients to prevent overdose deaths. There are various focused topics such as; improve opioid prescribing, prevent opioid use disorder, treat opioid use disorder, and reverse overdose. The most common reason people seek medical care is for pain. With the possibilities of addiction to narcotics, individuals are turning to complementary and integrative health approaches for pain management8. Complementary Care is using diverse health care approaches outside of conventional medicine. Integrative care is care that uses both conventional care and complementary care approaches. We outlined alternative options to treat pain outside of opioids, but what if an individual becomes addicted and needs to seek treatment? There are options which include a typical rehabilitation or inpatient treatment facility; and another option is medication combined with behavioral counseling to create a whole patient approach known as Medication Assisted Treatment (MAT)10 in an outpatient setting. Research shows that MAT decreases opioid use, opioid-related deaths, criminal activity and infectious disease transmission10. In addition, social functioning and retention in treatment increases when medication is part of treatment compared to individuals not treated with medication11. Despite the great results from Medication Assisted Treatment, less than half of privately funded programs offer this treatment6. This may be due to the belief that treating the addiction with other drugs will substitute one addiction for another. Studies show this not to hold any truth, but instead allows the individual’s brain to heal as they work toward recovery10. According to the National Safety Council, opioid addiction among employees affects nearly 70 percent of workplaces in the US. In a labor market that is already super competitive to find and retain top talent, there is a growing issue of employers struggling to find talented individuals who can also pass required drug screenings. On top of that, rising concerns are surfacing to ensure current employees do not develop an opioid use disorder12. An Employee Assistance Program (EAP) provider cited health claims for individuals getting treatment for opioid dependence has increased by 31 percent in just three years (2014-2017) and account for 67 percent of all substance abuse cases. There are a number of things employers can do to combat opioid use disorders or misuse of opioids. Whether you are reacting to issues that already exist or are being proactive to face any future issues, below are a few best practices that you can put into place12. Create a Drug Free Workplace: There are tools available to help you and your employees when it comes to battling substance abuse. The Substance Abuse and Mental Health Services Administration developed a toolkit for employers to implement a drug-free workplace. The information is comprehensive and includes policies, education, training and much more! Develop clear policies pertaining to drug testing, disciplinary outcomes and leave of absence. Training for supervisors to help them recognize signs and symptoms and steps for what to do next. 4Morone NE, Weiner DK. Pain as the fifth vital sign: exposing the vital need for pain education. Clin Ther. 2013;35(11):1728-1732. doi:10.1016/j.clinthera.2013.10.001. 5Van Zee A. The Promotion and Marketing of OxyContin: Commercial Triumph, Public Health Tragedy. Am J Public Health. 2009;99(2):221-227. doi:10.2105/AJPH.2007.131714. 9Clarke TC, Black Ll, Stussman BJ, Barnes PM, Nahin RL. Trends in the use of complementary health approaches among adults: United States, 2002-2012. National health statistics reports; no 79. Hyattsville, MD: National Center for Health Statistics, 2015.